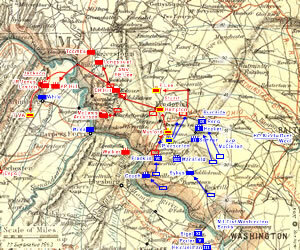 Ted Savas’ post on extending Brad Gottfried’s concept from The Maps of Gettysburg to other battles is exciting news. So, who’ll do Sharpsburg? With a budget of over a hundred maps and just over two weeks of 1862 to cover? Dang, what a project that’ll be. Yee-hah! Thanks to Dimitri for the pointer. Thanks for discusing this. The Maryland Campaign is something we are considering. But don’t quit your day job.